Pallet racking systems are proven to boost your systematic efficiency. Nieros pallet racking systems are just one type of our warehouse storage systems. 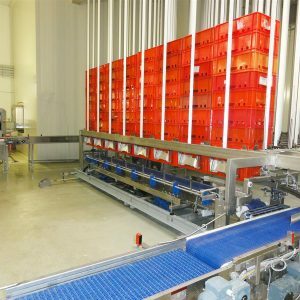 Understanding that storage and logistics are a challenge, Nieros has excelled in industrial solutions for hygiene and order keeping, including automated storage systems. While industrial storage systems are helping thousands of companies worldwide achieve their potential, we also have developed a range of industrial racking systems which will fit your particular demands. Companies rely on storage space. Today, highly technical concepts are standard, especially in large companies, since storage space ultimately causes costs. And automated warehousing ultimately reduces personnel costs. In smaller companies, manual solutions are still extensively used. Nevertheless, sometimes traditional ways of storage have certain disadvantages. This includes, for example, a not always optimal utilization of the available area. Nieros experts will devise a customized solution for your needs. Contact us through email, phone or in person, we will be happy to consider your case and offer your a personalized proposal, based on our extensive experience in Slovenia and abroad. Our partners value our innovative solutions and technical expertize, which are confirmed by the many certificates that have been awarded to us. We are waiting for you call.